Want to learn more about fireflies in general, both near and far? There is an on-line journal specifically devoted to fireflies- check out Lampyrid– some articles you have to pay for, but others are open-access. There’s a researcher in Malaysia working very hard to educate people about the amazing synchronized flashers in that area- check out the blog. Looking to make your yard, town, or city more fire-fly friendly? Firefly.org has suggestions for changes in your immediate environment, as well as small actions that can really add up across an entire region. A few years ago, the city of Kitakyushu in Japan made a concerted effort to bring back the fireflies which had once been a regular feature of their landscape- their work might inspire the community where you live. Hoping to get up close and personal with fireflies? If you are in South Carolina, the Clemson Firefly Project wants data from your backyard. Across the eastern US, the Boston Museum of Science is collecting data from backyard firefly enthusiasts through their Firefly Watch– head outside on a weekly basis, record the fireflies you see, and then submit the data. And if you’ve always dreamed of analyzing scientific data, they are looking for your help as well! 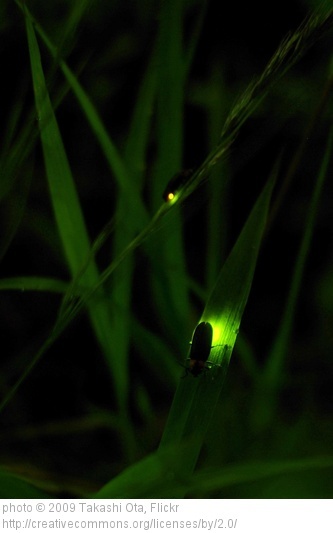 And for those of you who are long-term planners and will settle for nothing but quality time with experts, the International Firefly Symposium will be held August 11-15, 2014 in Gainesville, FL. It’s true that the summer season will be coming to a close in a few weeks, but you can still enjoy this year’s fireflies and start planning for how to help next year’s- and I’m sure that there are more options out there if the suggestions above don’t appeal to you. We can all work together to ensure that fireflies have a naturally bright future.